Over the years at the Grant Museum I’ve had the pleasure of answering a number of queries from art and archaeological museums and galleries. I’ve identified butterflies from an 18th-century series of drawings for an auction house. I’ve been asked to identify and comment on hyenas for Landscape, heroes and folktales: German Romantic prints and drawings. 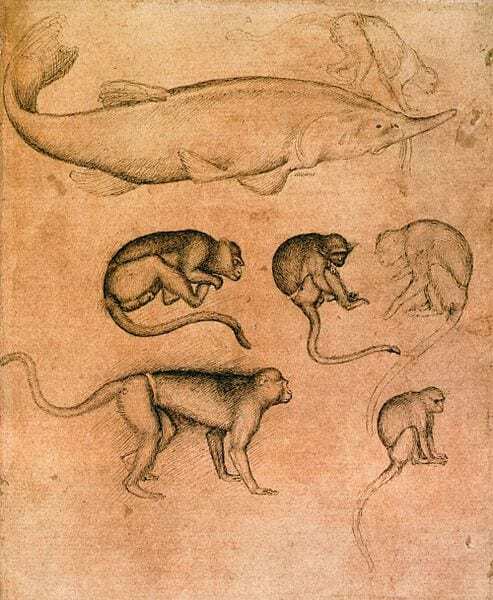 I had the absolute pleasure of getting up close to items in the Midenhall treasure at the British Museum to identify the animals depicted and most recently I was asked to identify the species of primate depicted in the Italian artist Pisanello’s fifteenth century sketches (which look like vervet monkeys to me). It’s always gratifying to see the museum (and myself I’ll admit) acknowledged in art history catalogues and papers, areas that I otherwise have no qualification in but most importantly thinking about the artists, their context and what they were doing when capturing animals is intellectually stimulating as well as historically important. One of the challenges of identifying animals in art is trying to establish what the intention of the artist is. Are they trying to capture every single hair, scale or wrinkle in photorealistic detail for a giant mural or are they merely practising their skills on a living animal? Are they attempting to depict a specific individual or are they trying to capture the ‘monkiness’ of monkeys to then be able to accurately depict fictional monkeys in a variety of poses in finished works? If it seems clear that they are drawing from real animals, are the animals alive or dead at the time? Given that even with today’s veterinary standards and transport methods it’s a tall order to move animals from one place to another without stress or in the worst cases death. How then do we find depictions of elephants in artworks going back to the 15th century? Were they drawn from life, or from a description of someone who claimed to see one or copied from a copy of a copy of somebody who saw one in life? Albrecht Dürer never saw his famous and widely reproduced rhinoceros in the flesh. Or are the depictions so off because the artist was studying a stressed, mistreated and malnourished animal? Many early depictions of fish probably look very odd to our eyes because the specimens likely studied would have been dead for many many hours or days before being brought to shore by fishermen, without the aid of today’s freezing and preserving techniques. 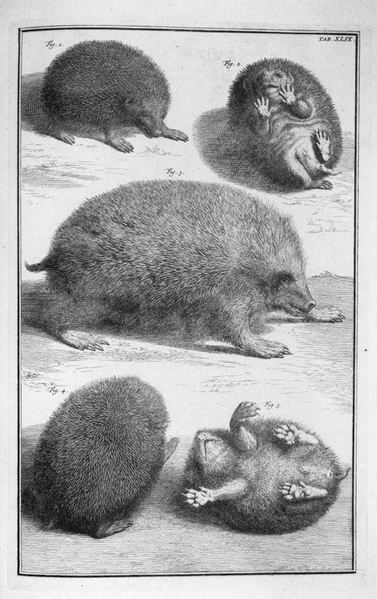 Engraving depicting different views of the hedgehog in Albertus Seba’s ‘Accurate description of the very rich thesaurus of the principal and rarest natural objects’. Seba [Public domain], via Wikimedia Commons. Before science was science and art was art it was actually impossible to separate the two. The earliest biologists were often natural philosophers or natural historians and a curiosity in the natural world would often accompany a skill or training in sketching, drawing and painting. What we’d consider to be the earliest illustrated descriptive biological texts were often catalogues or thesauri of rare and wonderful specimens in private collections. One of the most famous of these was the collection of specimens owned by the Dutch apothecary Albertus Seba his thesaurus of animal specimens, Accurate description of the very rich thesaurus of the principal and rarest natural objects (1735-1765), and collection are thought to have inspired Carl Linnaeus to come up with his system of biological classification in the 18th century which in a highly modified form is still used today. As a brief aside it is thought that this Grant Museum silky anteater (see below) may have been one of the specimens depicted in Seba’s thesaurus, however, it’s still unclear if this was the specimen sketched or if this specimen was preserved ‘after’ the sketch in an example of life (or death) mimicking art. 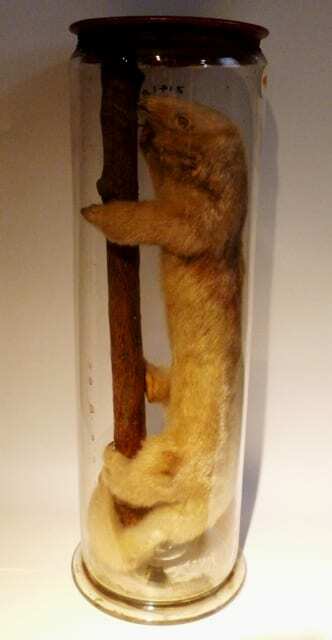 LDUCZ-Z141 Silky anteater preparation at the Grant Museum possibly illustrated by Seba and seen by Linnaeus? Sometimes an artistic depiction of an animal ends up defining it more so than the remains of scientific interpretations. By far the most famous example is the dodo. As far as it’s possible to ascertain there are few accurate depictions of dodos studied from life (if any at all). Early sketches by explorers and sailors were drawn from memory or from recently dead animals and from these crude depictions the standard ‘fat’ dodo is the standard image we conjure up even when analysis of dodo bones suggests they were far less podgy (Angst 2011). Continuing the theme of depicting extinct animals when it comes to long extinct animals artistic reconstructions are all we have to depict these animals in life. Take a second to think about mammoths, dinosaurs, pterosaurs and sabre toothed cats. The images we recall when thinking about these have all been created by artists. Artistic reconstructions still accompany descriptions of new species in palaeontology and are an assured way of securing column inches too. I’m sure that there are still many surprise discoveries to be made by scrutinizing animals in art and questioning how, when, why and what artists used for inspiration. I wouldn’t be surprised if some of our earliest records of various species are still untapped in the works in our archaeological and art museums. Animals have have a long standing in art but rarely do we focus on how art has had a long standing in zoology. Angst D, Buffetaut E, Abourachid A. (2011) The end of the fat dodo? A new mass estimate for Raphus cucullatus. Naturwissenschaften. Mar;98(3):233-6. doi: 10.1007/s00114-010-0759-7. UPDATE 23/05/2014. I forgot to mention the excellent exhibition Curious Beasts: Animal Prints from the British Museum by colleague Alison Wright. For those interested in animals in art, the amazing catalogue is well worth tracking down.